“Walking in the street is HIGHLY DANGEROUS and PROHIBITED by Law”. I don’t disagree that walking in the street is HIGHLY DANGEROUS. Is it really PROHIBITED though? If I park on the side of the road, must I exit through the passenger door? If so, it is the least enforced law on the books. I know the sign is not official, I can tell from the wrong typeface and mixed use of capital and lowercase letters. So if a sidewalk is provided and accessible you do have to use it. 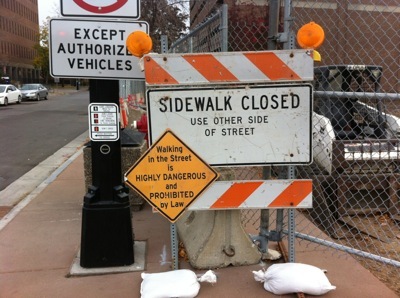 Should not a sidewalk be on both sides of the road to be “accessible”? This does not answer the question about exiting a parked car. Maybe I should climb on the roof to avoid walking upon the adjacent roadway. At any rate, to my disappointment, the sign is not actually lying. Which moves us to the next question: why does a developer (Opus), pitching itself as transit friendly, get to close a sidewalk in an existing pedestrian district? Why are they not taking space from motor vehicles to create a temporary sidewalk? It’s not like Walnut does not have plenty of space and very little traffic. Furthermore, why do the new traffic signals have pedestrian actuators. Shouldn’t pedestrians get phases automatically, without pushing a button? I can see maybe as a call button, but not as the only way to get a ped phase.